Earlier in January, Binance, the largest cryptocurrency exchange by traded volume, announced that it would launch new token fundraising events every month through its Binance Launchpad platform. Sooner, rather than later, the first results have started to come through. One of the most anticipated token sales on the new platform so far was that of BitTorrent. The project managed to raise $7.12 million in less than 15 minutes, sparking interest in the entire community, while also hinting at the fact that ICOs may be plotting a comeback. But that wasn’t the only successful project. As promised, a month later, Binance Launchpad had its second fundraising, backing a project called Fetch.AI. This one was even quicker and raised $6 million in a whopping 10 seconds. Naturally, following their listings, the respective tokens saw a surge in their price. This triggered massive interest on behalf of community members. It’s also worth noting that Binance marked the beginning of large exchanges opening their token sale platforms. Dubbing this kind of fundraising as “Initial Exchange Offering” (IEO), five more exchanges have announced that they will launch their own IEO platforms (among them you can find Bittrex, KuCoin, Okex, etc.). Therefore, we’ve taken the liberty of providing you with a fully-fledged and comprehensive guide to using the Binance Launchpad platform so that you take part in the fundraising events organized on it. Let’s start with the basic things. First, you have to log in to your Binance account. If you don’t have one, you need to create it to access the Binance Launchpad. You can find out how to open a Binance account here. Once you have logged in, you should navigate to the left of the top menu and select the Binance Launchpad from the drop-down option. Right at the center of your screen, you will find the projects featured on the launchpad platform. They all have their statuses carefully laid out for full comprehension. Those that are about to enter their token sales are usually on the left, and they show the user a summary of the primary information. This includes the session supply of tokens, as well as the start time. By clicking on any of the projects, you enter the dedicated page on the platform which contains all the necessary information about the project. As you can see, there is also a Buy Now button. At the time of writing this wasn’t active because the token sale hadn’t started yet. Below you can see the requirements tab. You have to complete those requirements to be able to participate in the token sale. They vary based on the project, but for most of the projects, the investors have to follow the generic verification process. Step 1: The first thing to do is to enter your personal information. Step 2: Once that is done, you have to submit a picture of your ID. The process is quick. Although you can take pictures with your laptop’s camera, we recommend that you take separate photos with your phone for everything to be perfectly readable. This will also speed up the process quite a bit. Step 3: Then you have to go through the facial information step of the verification process. Binance is very thorough. You have to write down the current date as well as the word “Binance” next to your face while the software takes a picture of you with your laptop camera. Step 4: Technically, you’re all done. However, once you have completed all of the above, you have to allow some time for the team to get back to you with approval or with an additional request in case something has gone wrong. 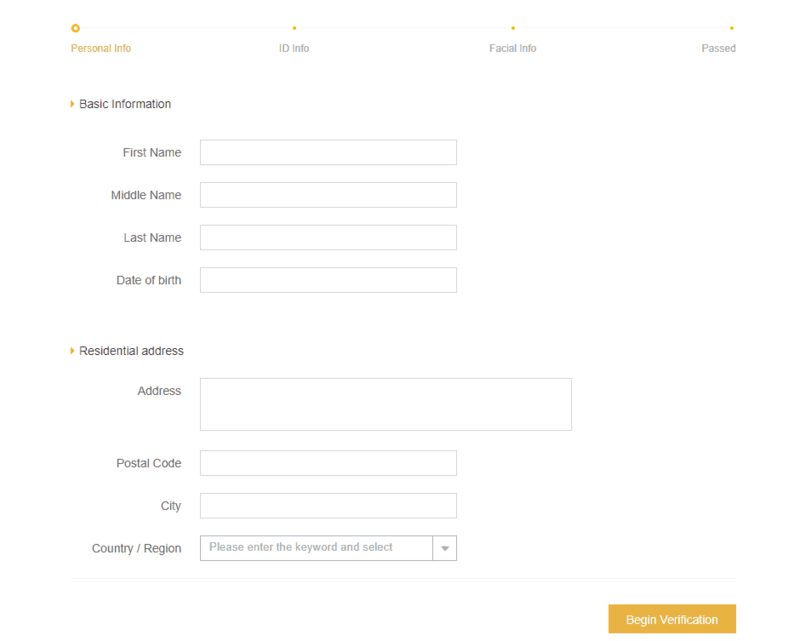 In the requirements tab, you will also notice that there are countries which are currently not allowed to participate in the fundraising event. Of course, before you invest in any projects, one should do in-depth research on each one of them. 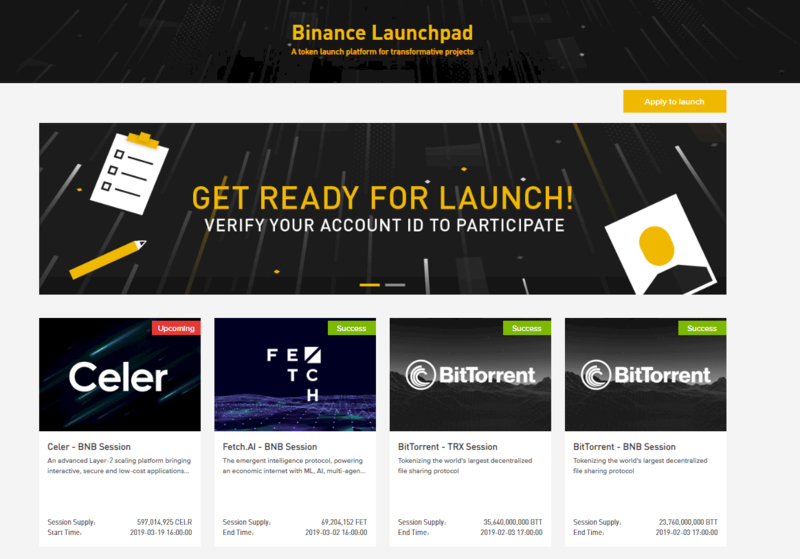 Binance Launchpad has compiled extensive and important information about every single project and has put it down below the requirements tab to ensure that it is easily accessible. Besides, Binance had created a research center where they conducted in-depth reviews for each of the projects that are listed. We recommend that before investing in any of the projects, please read a full report of the project. That’s pretty much everything there is to it, so you can be ready to make your first investment on the Binance Launchpad. If you’ve completed all of the requirements, and you’ve gone through the project description, you have to check when the sale session begins and prepare yourself. Please note that each session allows users to buy the tokens using a specific token. So far this year all the token sales were carried out using this model except for BitTorrent. In BitTorrent users were able to purchase BTT Tokens (BitTorrent), using both BNB and TRX (Tron coin). Therefore, two separate sessions were carried out at the same time. In this case, there were two separate sessions for the same token sale for each one of the tokens. 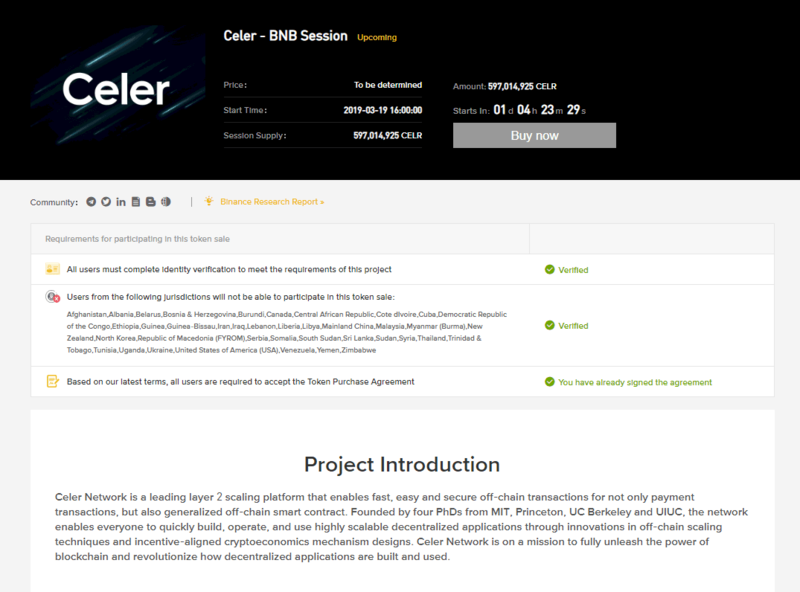 BitTorrent was available in both sessions – TRX and BNB. As we mentioned previously, you can’t click on the Buy Now button, shown in the section where you can see the price, start time, and session supply until the session has started. Once it has, the button will become active, and you will be able to buy the designated amount of tokens using the session’s token. As you can see, there is absolutely nothing challenging in participating in a fundraising event on Binance Launchpad. On the contrary, the team has gone above and beyond to make sure that everything is simplified, accessible, and very easy to go through. However, keep in mind that currently, these fundraising events trigger massive interest. This is why thousands, if not hundreds of thousands of people take part. As we mentioned before, the sale of Fetch.AI was over in 10 seconds, which is why it is incredibly challenging to manage to participate in time. However, apart from the severe competition, everything else is absolutely seamless and very easy to work with. The post Binance Launchpad – The Beginner’s Guide: How To Invest In Token Sales appeared first on CryptoPotato.